is generally for humans the visible range of the electromagnetic radiation from approximately 380 to 780 nanometers (Nm) wavelength (according to a frequency from approximately 385 to 789THz). „Millions of small light packages meet our eyes and approx. 200 million rods and small plugs absorb it and possibly something computed then for each energy unit, a three-dimensional color area and pass it on. But only where? Who interprets for you? Who joins the millions light packages again to a picture? Where does the picture, which I see, develop? Where does it begin and where it stops, in you? Where does your brain stop? What is what I see? In a motion picture film, we see also only the individual motionless scenes. Who joins it to a simulated movement? Do we move or do we perhaps only move in motionless frames and interpret ourselves then as our movement? So, as if one arranges the individual pictures of a film not closely next to each other, but one behind the other. Better said, thus as if one lines many holographic plates up one behind the other, by which we are then projected by our consciousness. it is not as simple to understand how humans perceive light, colors and movements. Therefore this chapter is dedicated to better understanding of the visual sense. Why do we see colors? The different spectral absorbtionsfactors of the pigment molecules (blue, green-yellow, orange-red) contained in the three different types of rods and small plugs in the human eye, makes it possible, by the narrower absorption spectrum of its pigments that we can see colors. The rods contains the molecule Rhodopsin, which has a broader absorption spectrum. They are more sensitive than the small plugs in our eye and register the luminous intensity. 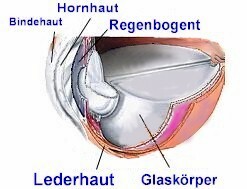 The color effect of physiological seeing is based on the different spectral absorption by the pigments in the small eye plugs. The different noticed colors correspond light, with different spectral distributions. If certain wavelengths from an even spectral distribution of light are absorbed, the color impression develops from the remaining wavelengths (complementary color) . 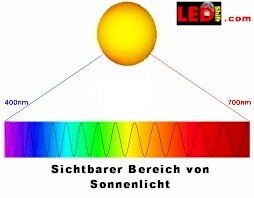 A green leaf absorbs therefore not in the wavelength coverage „green“but within the complementary range „red“ (680 nm) and „blue“ (430 nm). Since however each human is singular, we take also the colors different. During the day humans see best with approximately 555 Nm (yellow-green). At night other receptors of the human eye react, they are most sensitive in the blue range. Very strong sources of light, whose warmth we can feel, we see also within the infrared range (IR) to approximately 1100 Nm. Ultraviolet light we can see about 300 Nm notice. The light occurring in the environment is a mixture of different wavelengths. By a diffraction grating or a prism one can divide this polychromatic (multi color) light into its monochromatic (in-colored) components. Everyone of these monochromatic light components corresponds to a specifically human color impression, which together represent the spectral or colors of the rainbow. Because sunlight contains all colors, we see the "color mixture" white. With white Led's one can seize e.g. 3 different colored Led's (red, blue, green) in one LED together and one receives the color white. The best researched sense is the visual sense. Scientists sought out and examined the connections of the neurons in the visual system laboriously, how particulars of these cells react to light attractions and process them. Therefore we know quite exactly, how the brain analyzes pictures of the eyes. But it is much more difficult to understand how the performance of the brain join all items of information together. In a case, i.e. during the color perception, we can describe the brain achievements lying to reason however ever better. Most humans think that the relationship of reflected red, green and blue light determines the color impression of an object in the eye. It can be shown however easily that this acceptance does not apply! In addition one must only realize that objects maintain the same color, whether we regard it now with daylight, neon light or candle light, which are together set from completely different wavelengths in each case. Edwin Land, the inventor of the instand camera, has an explanation for this phenomenon offered and formulates the so-called Retinexhypothese. This term consists of "Retina" (retina) and "Cortex" and is intended to clarify that both parts of the eye system are involved in the color perception. According to the Retinexhypothese Retina and Cortex cooperate with one another, in order to accomplish complex calculations on the basis of the entire beam of light on the Retina. For everyone of the three light wave lengths, which we recognize as red, green and blue and for the different receptor cells in the Retina are in each case most sensitive, separate computations are employed. After the Retinexhypothese each noticed color is fixed by three numerical values. This is calculated, in that the quantity of light, which falls from the regarded colored object on the retina, is divided for each of the three wavelengths by the weighted average quantity of light of the same wavelength within the entire visual field. Caused the weighting that light from the environment of the regarded object is more strongly stressed, as light from far removed places. The three numerical values represent to a certain extent coordinates in a three-dimensional color area and specify each point of the visual field colored clearly, as three local coordinates the situation of one point in the area clearly to describe. Land accomplished numerous experiments, which confirm that the described Retinex calculations permits accurate forecasts with unusual lighting conditions, which color an observer will see. Probably our visual system developed thus in the way that we notice the colors of objects always directly, independently of the wavelength spectrum of the light, which falls on our retina. Retinex calculations take place themselves very fast and are not not conscious. Meanwhile there is reference that this ability was developed already promptly in the evolution. David Ingle of the Northwestern University in Evanston (US Federal State Illinois) showed for example that a goldfish brain Retinex calculations accomplish, which permit the animal to recognize and select a special color, even if the spectral composition of the light is changed.